Cathelco announced that its Evolution ballast water treatment (BWT) system has begun shipboard testing for U.S. Coast Guard Type Approval. The system has been installed on the Svendborg Strait a 1,085 TEU containership owned by Carsten Rehder of Hamburg. “From the start of this project to the final completion we appreciate the care and attention to detail from Cathelco, leading to a smooth, trouble free installation. We are very pleased with the outcome and look forward to continuing our relationship with Cathelco,” said Julian Glogowski, technical director at Carsten Rehder. The installation follows the completion of the land-based testing phase at Marine Eco Analytics (MEA-nl). The Evolution BWT system, based on a combination of filtration and UV technology is being tested for Type Approval to the ‘live/dead’ standard demanded by the U.S. Coast Guard. “The system on the Svendborg Strait was installed a day ahead of schedule within a very confined area, demonstrating the flexibility of the equipment,” said Peter Smith, sales director of Cathelco. The installation of the 500m3/h Evolution system was undertaken within eight days at the Norderwerft yard in Hamburg. Commissioning and crew training was carried out on the ship’s first voyage. 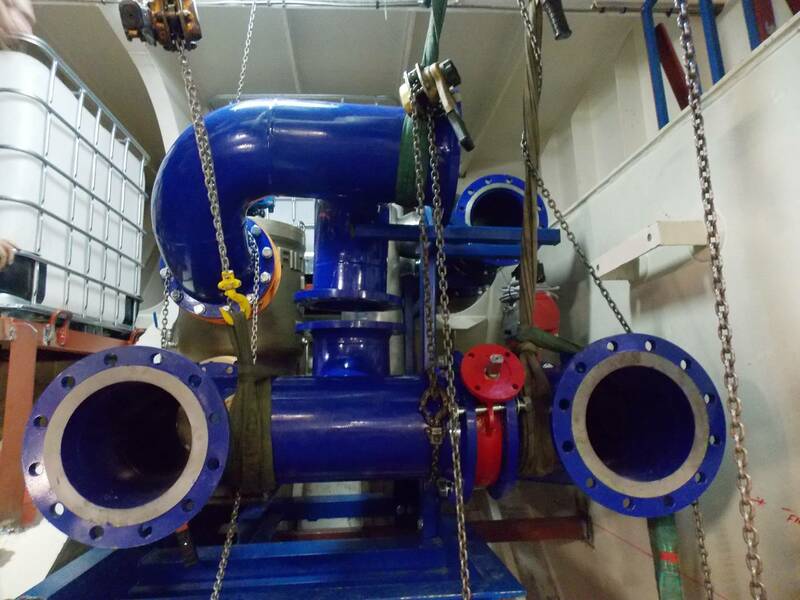 An important factor in the smooth running of the installation was the use of Munchmeyer Petersen Steamship (MPC) as project managers. It is anticipated that the results of land based testing will be compiled and completed by November 2016. Shipboard testing is schedule for completion by the end of March 2017 with the aiming of achieving U.S. Coast Guard Type Approval before the third quarter of 2017. The Evolution system will supersede the original Cathelco BWT system which was launched in 2014 and already has IMO Approval and AMS certification. Prior installations include systems for ships ranging from ro-ro carriers to offshore supply vessels. A key factor in the design of the Cathelco Evolution system is the ability to precisely adjust the UV dosage according to the prevailing sea water conditions. The system uses a UVT sensor to measure UV light transmittance – the amount of UV radiation passing through a sample of sea water before it reaches the UV chambers. This is a very reliable parameter for calculating the UV dose as well as ensuring that power is used economically. Other important features of the system are stepless power control, inlet manifolds designed to make the water flow in a helix to increase exposure time during irradiation and a chemical free cleaning system.